The ridiculous, sappy truth is that, when a long-running series has been flailing a bit, getting to see familiar recurring characters piling up in an episode like tray-bearing waiters in the stateroom scene in A Night At The Opera can make you feel like you’ve been thrown a life preserver. This is a standard-edition home-game episode designed to move the season’s big overarching storyline forward, while bringing in enough old favorites to remind us why we might care. It’s nowhere near as imaginative or affecting as the best stand-alone episodes from this season, and I don’t want to overpraise it, but once it gets rolling, it does restore the feeling—which the last couple of episodes from a month ago left a little dented—that the people making this show still know how to make it work. It even makes good use of Crowley, and after some of the things I’ve written about him in the past, it is no simple thing for me to admit to having been glad to see Mark A. Sheppard. It’s almost the waking version of one of those dreams where I show up for the final exam in my underwear. At first, I thought the pre-titles sequence, in which Castiel wastes Dean, must be a dream sequence itself. But then Naomi makes her entrance, and it’s revealed that she has been putting Cas through his paces, making sure he’s prepared to do the hardest thing he’ll ever have to do on Earth—kill his man-crush, Dean—by making sure he’s well-rehearsed. A striking image counts for a lot on this show, and the shot of what looks like an underground parking garage littered with scores of Jensen Ackles corpses definitely qualifies. Soon Cas is back among us mortals and working with the brothers again. He thinks he knows where to find the “demon tablet” that has the power to permamnently seal the gates of Hell, so they head off for one of “God’s crypts” together—even though Cas seems trigger-happy about dispatching any demons that cross the path, and the Winchesters can tell that he’s not quite himself. The best gimmick here is the device of cutting back and forth between the action in the terrestrial world and the scenes in Heaven (or inside Cas’ head), with Naomi guiding his actions, telling him who to smite and when to lie, and, inevitably, ordering him to kill Dean. The MVP is Meg, who the boys find, like an extra prize at the bottom of a Crackerjack box, when they’re searching for the tablet. Meg has spent a year being tortured at Crowley’s hand, an experience that has only honed her gift for the killer wisecrack. (He calls her "my favorite chew toy.") She opens with a smart remark about Dean’s height and then says to Sam, who is at his most mouth-breathing, “You know, I get why Crowley calls you ‘Moose’ now.” Nor does she have a problem turning the knife on herself; she’s sporting badly dyed, stringy hair, which was apparently one of Crowley’s torture techniques: “Just another reason I want to stab him in the face.” The only person she has no interest in picking on is Cas; somehow, even when she sort of insults his intelligence, it has a tenderness to it. At the end, making ready to sacrifice herself for his safety if necessary, she calls him “my unicorn.” I haven’t choked up like that since J. R. Ewing’s funeral. There is a big reveal, not counting the absolute no-brainer that Naomi overplays her hand when she tries to make Cas kill Dean. (Instead, she inadvertently opens the door to the Manchurian Candidate moment when his natural instincts overcome his brainwashed conditioning and he can break free of her control.) It turns out the demon tablet is actually an “angel tablet,” which has the power to do God knows what, and which the angels want to keep under wraps. At the conclusion, Cas has it under his coat as he lights out of Dodge, while Naomi sits in her office, on the receiving end of a pissed-off stare from an Asian woman who is presumably her boss. It’s not clear if he has a game plan beyond keeping his head down, but a road trip is a road trip. We probably won’t get it, but at this point, I’d kill for just one episode devoted to Cas’ solo adventures in America, even if he is leaving the driving to Greyhound. 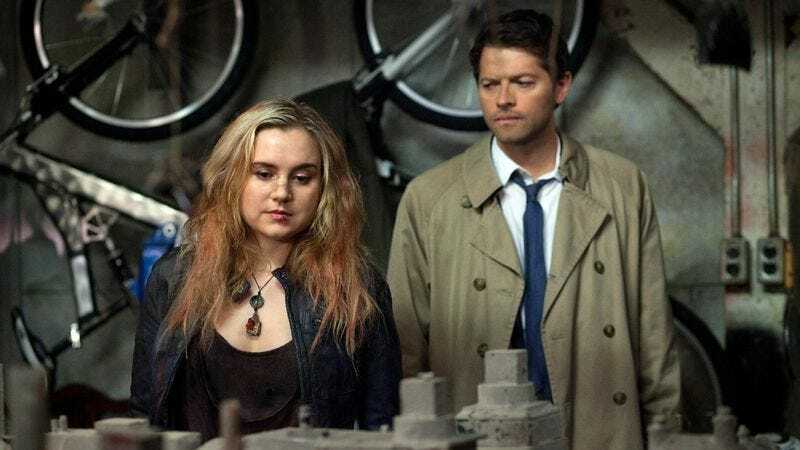 Supernatural has never turned up its nose at the occasional jokey pop-culture reference, but in this episode, the show practically morphs into a Joss Whedon production for minutes at a time. There are out-of-nowhere references to Glengarry Glen Ross, Zero Dark Thirty, Bill Nye the Science Guy, and even a couple of references—to Geraldo Rivera’s 1986 TV special about Al Capone’s secret vault, and Clarence the angel in It’s A Wonderful Life—that count as callbacks to previous episodes. When Cas doesn’t get the one about Clarence, Meg chides him: “Would it kill you to watch a movie or read a book?” (He replies that seeing a movie wouldn’t harm him, but it would depend on which book.) The thing is, given the way these characters live, it’s hard to understand how any of them manage to keep up with anything, which is why it’s always seemed so plausible that Dean’s taste in music appears to have calcified about three years before he was born. When Meg and Cas are flirting, with all the heavy lifting being done on her side of the fence, she asks him if he’s fully recovered his memory, and if so, if he can recall some of the sweet times they enjoyed. “If you’re referring to the pizza man,” says Cas, “yes, I remember the pizza man. And it’s a good memory.” I choose to believe this means that, at some point when he and Meg were on the lam, Cas had a one-night stand with Frank Furillo.